We live in a “connected” world–almost every system has to exchange data with other systems. One of the oldest and most widespread communication protocols is FTP. In this article, Bogdan Zamfir shows how you can incorporate FTP access into your applications. Using FTP, your applications can download data files (text or binary) from an Internet site, and upload data files to a central site (again, sending either text or binary data). All of this is under the control of your code, thanks to a handy class module included in this month’s Download. The client application connects to an FTP server and provides the username and password to authenticate. If authentication succeeds, the server logs the client on to a specific account, based on the username and password. The client application can then navigate through the folder structure of the FTP server, retrieve directory listings, upload and download files, create and remove folders, and rename or delete files. Some of those actions can be restricted, based on the rights of the accounts the user has logged into. The client application logs out from the server. InternetOpen–Returns a handle to be used in subsequent calls. FTPGetCurrentDirectory–Returns the current directory name. FTPGetFile–Downloads a file from the FTP server. FTPPutFile–Uploads a file to the FTP server. 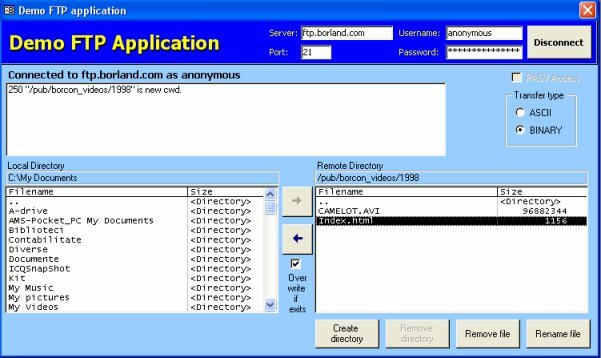 FTPFindFirstFile and InternetFindNextFile–Used to enumerate files and directories on the FTP server. FTPDeleteFile–Deletes a file on the FTP server. FTPRenameFile–Renames a file on the FTP server. FTPCreateDirectory–Creates a new directory on the FTP server. FTPRemoveDirectory–Removes a directory from the FTP server. InternetCloseHandle–Closes the handle opened in InternetOpen. If this is looking like a lot to learn, don’t panic! I’ve taken care of most of the work for you. Server–The name of the FTP server to connect to. Username–The default value is anonymous. Password–The password used to authenticate on the FTP server. The default is empty. The Server, Username, and Password properties are Read/Write when the FTP object isn’t connected to the FTP server and Read-only when connected. The values can either be set before calling the Connect method, or passed as parameters to the Connect method. If they’re passed to the Connect method, the value can be read from the property after calling the Connect method. Port–The port number for the FTP connection. The default value is 21. PASV–If set to True, PASV mode is used. Port and PASV are Read/Write when the FTP object isn’t connected to the FTP server and Read-only when connected. They must be set before calling the Connect method. PathSeparator–When not connected, returns an empty string; when connected, returns the character used as the path separator for the FTP server the application is connected to. Most FTP servers use / (forward slash) as the path separator. However, there might be some FTP servers running on the Windows platform that use \ (backslash) as the path separator. Read-only. IsConnected–True if the class is connected to an FTP session; False otherwise. Read-only. TransferType–Type of data transfer used when uploading or downloading files. This can be ASCII (used to transfer text files), binary, or image (both used to transfer binary files). This property must be set to one of the values TransferASCII, TransferBINARY, or TransferIMAGE, defined as constants of the FTP class (Read/Write properties). The Connect method connects to an FTP server. The Connect method accepts three parameters: the name of the FTP server, a username, and a password. If some of its parameters are missing, Connect uses values stored in the appropriate properties. The only required parameter is Server (if the Username is missing, Connect uses anonymous). To close the FTP session, you call the Disconnect method, which accepts no parameters. oFiles–A collection that will contain all of the files retrieved from the FTP directory. Required. cSkel–A wildcard-supporting skeleton of files to be retrieved (that is, this parameter can contain the characters * or ?). Optional. cFlags–Attributes of the files to be retrieved. Setting this parameter to Empty means normal files will be returned, R means Read-only files, and D means Directories. File attributes can be combined in any way. The default value, RD, means to retrieve all files and directories. Optional and read-only. The oFiles collection will be populated with bzFile objects. The bzFile class has only three public properties: filename, attribute, and filesize (in bytes). File attribute has the same as attributes as those passed to the cFlags parameter (DR). The directory listing on some FTP servers doesn’t include double dots (..) for the parent folder. However, it’s always included in my oFiles collection. The FTP class allows several operations to be performed on directories on the FTP server. Directories can be created or removed, the current directory can be changed, and the current default directory name can be retrieved. CreateDirectory–Creates a new directory on the FTP server. The function can fail if the server doesn’t allow creation of directories. RemoveDirectory–Removes a directory on the FTP server. The function can fail if the server doesn’t allow removal of directories, or if the specified directory isn’t empty. SetCurrentDirectory–Changes the current directory. This method can fail if the directory doesn’t exist or if access to that directory is restricted. GetCurrentDirectory–Returns the name of the current directory. The first three methods accept a single parameter, the name of the directory. cRemoteName–The name of the remote file to download. Required. Overwrite–If True, tells the class to overwrite any local file with the same name as the remote file when downloading. If set to False (the default) and a local file with the same name already exists, the download will fail. Optional. cLocalName–The local name for the downloaded file to be saved to. If missing, the file is downloaded using the same name as the remote name to the current directory (usually the directory with the Access MDB file). The transfer mode for downloading the file is set using the TransferType property. Optional. cLocalName–The name of the local file to upload. Required. cRemoteName–The name to give the uploaded file at the server. If missing, the file is uploaded using the same name as the local name. Optional. Besides uploading and downloading files, my FTP class allows you to delete and rename files on the server using the DeleteFile and RenameFile methods. To demonstrate the class in action, the Download file for this article contains a simple, yet full-featured FTP client application built around my bzFTP class. The interface of the application is shown in Figure 1. On the top band, there are boxes to let you enter a server name, port, username, and password. Below, there’s a multi-line textbox that displays the answer received from the FTP server after processing commands. There are two listboxes on the form, used to display the local current directory (on the left side) and the remote FTP current directory (on the right side). The user can select files from the local directory list and upload them to the FTP server by clicking the Upload button (the right arrow button). To download files, the user selects the file from the FTP directory list and clicks the Download button (the left arrow button). The function that downloads the selected files works the same way as UploadSelected, except it reads from the right-hand listbox and uses the GetFile method. Also, it uses the checkbox option, which determines whether overwriting an already existing local file is allowed. I’ll omit that code here, but you can find it in the Download file. One warning: My class module uses synchronous transfer mode. This means that when you call a method in my class module, the method doesn’t return control to you until it’s finished its job. This is fine for short operations like retrieving a directory listing, working with directories, and transferring small files. However, it can be a problem when uploading or downloading big files because the application seems to be locked while the transfer is in progress. While there are many third-party libraries and ActiveX controls that implement the FTP protocol, there are several benefits to using my class library. My code uses the WinINET API as the foundation for implementing FTP, an API that’s available on virtually all Windows platforms. The application is self-containing; it doesn’t rely on external components, which, if not properly installed, can prevent an application from running. There are no potential problems related to setting up references, which can be a problem when using COM or ActiveX components. You’re ready to start moving data around. Most FTP servers feature a special account, known as anonymous, that allows access to any public folder on the site. Usually, the anonymous account allows only read-only access. Some FTP servers allow a single session for a given user at a certain moment, some allow a limited number of active concurrent sessions, while others allow unlimited concurrent sessions for the same user. 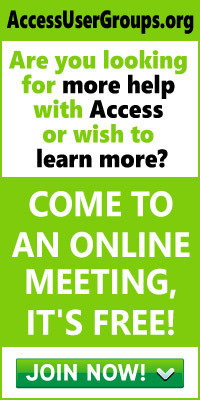 An anonymous account allows unlimited concurrent sessions, because it can be used by any number of users who want to connect to the server at the same time. These differences are important when deciding how to implement a client application. For instance, if you drop your connection to an FTP site that doesn’t support concurrent logins, the server won’t immediately release the session thread. Because of this, if you try to reconnect immediately to the FTP server, the connection is refused because the server thinks your account is still connected. In these situations, it’s essential that you quit the session before you drop your connection. FTP can be used in two modes–normal or PASV. In normal mode, when an FTP session is started, a connection is opened between the client and the FTP server (typically on TCP port 21). This is called the control connection. This connection is used to send commands to the FTP server and to receive responses but not to move any actual data. When the client application tries to upload or download a file to the FTP server, another connection is opened between the server and the client, initiated by the server (typically on TCP port 20). This is the data connection, and it’s used to transfer the file between the client and the server. Since firewalls block several TCP ports (including port 20), normal mode can’t be used on a site behind a firewall. It’s possible to configure a firewall to allow access on this port, but this creates a security breach. To handle this, the FTP protocol was enhanced to allow PASV mode. When the connection is opened in PASV mode, the server doesn’t try to open a data connection to the client application on port 20, but instead lets the client application open a data connection back to the server on an arbitrary port chosen by the server. The server sends the port number to the client as the answer to the PASV command (hence the name of this mode). For more information about FTP, read FTP RFC 959 at www.ietf.org/rfc/rfc0959.txt.